This is a catalogue raisonné of the etchings drypoints and mezzotints produced by James McNeill Whistler during his working career, between 1854 and his death in 1903. It is intended as a comprehensive guide to these works based on the works themselves, the copper plates, and documentary or published records. Several works formerly attributed to Whistler have been omitted from this catalogue, because recent research has established that they are not by Whistler. Where there is any doubt about the attribution of a work or of a particular impression, this is discussed in the catalogue. The catalogue raisonné itself, with each work and different states illustrated and discussed. A list of impressions that have been located and catalogued, mainly in public collections. The completed catalogue as published online, and freely available to all, will not be published in book form. It will be updated at regular intervals and further information is welcome. 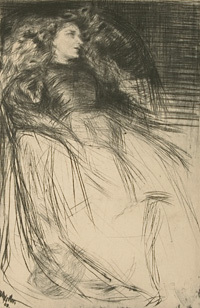 Sets and Series - further information about sets and series of etchings produced by Whistler. Margaret F. MacDonald, Grischka Petri, Meg Hausberg, and Joanna Meacock, James McNeill Whistler: The Etchings, a catalogue raisonné, University of Glasgow, 2012, on-line website at http://etchings.arts.gla.ac.uk. The catalogue numbers should be referred to for short as G.